At one point in Rabindranath Tagore's poem Dui Bigha Jomi, the narrator returns home to his village. It's a brief visit. His meagre landholding has been taken away by the zamindar. Our hero pines for his land, the shade of the trees, the smell of the soil, the cool breeze. Now this is not the archetypal poet romanticizing nature. There is a message in the farmer's longing for his lost tract land is not just crops, it is good for food production, it provides ecological services such as soil formation, pollution control, nutrient recycling, pollination as well as recreation. In recent times, environmental economics has recognized the ecological value of land. In a seminal paper in 1997, environmental economist R Costanza and his colleagues enumerated 17 ecological services and pointed out that a cropland provides 15 of these.Since then, there has been a lot of research on the services provided by various ecosystems. But research on services rendered by croplands has been relatively few. It also has to be recognized that the term cropland refers to various types of land that yield diverse crops. A cropland that signifies a pristine natural ecosystem is rare. In most cases croplands are semi-natural with varying degrees of human intervention. Environmental economists have estimated with some degre of accuracy that in the near-natural croplands food production--or cash crop production--contributes just one per cent to the total value of the land, but in croplands with high level of inputs crop production accounts for about 30 per cent of the land's total value. Not just economists. Poribesh Porichoy, a textbook for ninth grade students in West Bengal published by the state's board of secondary education puts the value of timber of a 50-year old tree at only 0.8 per cent of the tree's total value. The rest of the value comes from ecological services rendered by the tree. 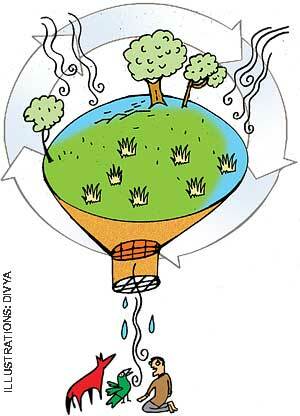 The primer draws on an estimate popularized by environmentalist T M Das in the 1980s. But the fact that land provides services other than crop production has been lost on our policy-makers. The market also does not account for the ecological services provided by land. Let us take the compensation package offered to farmers whose land was acquired for the now-aborted small car factory in Singur, West Bengal. It is now well-known that farmers were paid Rs 8-12 lakh per acre. The West Bengal government claimed it paid the current market price. What would be the value of the Singur land if we accounted for all its ecological services? We do not have figures. But let's put a conservative value to crop production in Singur--croplands here are nowhere near as high yielding as those in highly subdized farms in the US or Japan. So, we can say with some certainty that crop production would not contribute to more than five per cent of the value of land in Singur. Therefore, the compensation package of Rs 8-12 lakh represents just 5 per cent of all value of the land. If the ecological services of the land were also accounted for, the price of the land would have been between Rs 1.6-2.4 crore per acre. Since the lease is for for 90 years the amount would have been between Rs 144-Rs 216 crore per acre This is not to suggest that the Tatas should have paid a such a staggering sum, but emphasize that compensation package reimburses only a fraction of the loss suffered by the farmer and the community is not reimbursed at all. Critics might say that land transactions between farmers also do not account for ecological services. They do not. But land does not change character as a result of such transaction. Earthworms, for example, continue to form topsoil, distribute nutrients and maintain the texture and water permeability of the land. Converting land for industrial activities, deprives society of its ecological services. The secret of high gains to industries compared to agriculture lies also in the expropriation of huge natural social capital.